Choosing Training Can Be Overwhelming. The Good News Is, We Can Help. Please take a moment to look through our available programs. Then just fill out our contact form and we’ll get back with you via email to set up a free phone consultation with our head trainer, Viktoria. She will be happy to assist you in determining which program will see the best results for you. Ready for that rock star dog you’ve always wanted? Imagine your dog greeting guests politely with all four feet on the ground, walking calm and happy beside you, and laying quietly on their dog bed while you eat dinner. We’ve made this a reality for hundreds of “impossible to train” dogs. Yours can be next. When it comes to training, what you put into it is what you get out of it. We empower you with a way to communicate clearly to help strengthen you and your dog’s relationship. Private lessons will benefit you a great deal if you’re committed to seeing results! This program is perfect for the dog that is happy go lucky but needs a reminder of polite manners and calming excitability. Stop common problem behaviors like jumping, pulling, barking, selective hearing and more. Is your dog the embarrassment of the neighborhood, lunging and barking at passing pedestrians? Do you find excuses not to invite guests over because of your dog’s inappropriate behavior? You’re fed up and frustrated with your dog ignoring your every word? We know that dog, and we’ve turned them around for hundreds of owners. With this program, we can show you how to turn around the problem dog into your dream dog. Your dog will learn all the foundation obedience as well as off leash communication. But more importantly, we’ll help you build a respectful, trusting relationship so you can enjoy a happy, healthy life with your dog. Through remote collar training, your dog can be a dream dog. 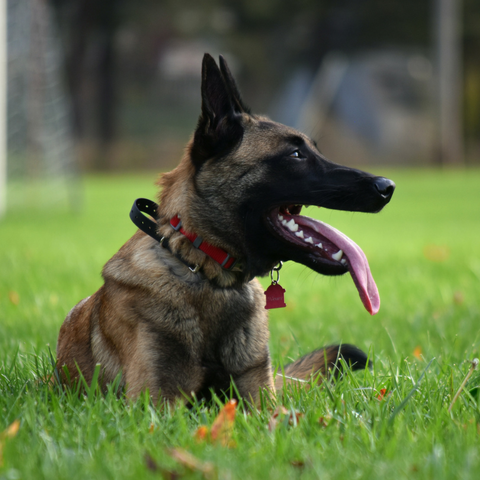 What is remote collar training? It’s using a low level tap to gain your dog’s attention either to request a behavior from them or to distract them from continuing an activity they should not be pursuing. Every client feels the collar before using it on their dogs and says it feels like a tickle. Remote collars are as far removed from shock collars as the first cell phones are to iphones. Your dog should not be afraid or in pain, but actually happy to see the collar and do the work. The wonderful thing about this method is the ease of transfer from trainer to owner. Expect an excellent companion that has found a cheerful outlook on life. Our most popular program is perfect for the dog that is struggling with more extreme behavior or an owner looking to be able to do more with their dog. Training collars are not included in the program price but range from 175 -250 depending upon the model.
" This training has changed our lives and helped create a more harmonious home for our family. " If you dream of a dog that listens on or off leash no matter the distraction then our bootcamp may be for you. In our revolutionary new set up, your dog stays with us Monday thru Friday and visits home over the weekend. You get to be part of the learning process throughout while having a foundation set up for you. With our BT program, your dog gets to live with our trainer 24/7. This allows for a learning environment facing the same challenges that they do at home. They will learn manners while she cooks dinner, socialize with her pack, go on walks through the neighborhood and the added bonus of a vet clinic in our backyard, they’ll get the distraction of many dogs and cats. On top of on and off-leash obedience, your dog will be learning how to be a calm polite member of the family. We want the relationship to be a happy healthy one to give you the most enjoyment out of your dog. Through state of the art gentle remote collar training, we create a line of communication for you to continue at home. Bootcamp allows our trainer to establish structure and clarity for you to implement smoothly into your home life. We give you a boosted headstart working through the early struggles of teaching a new command and addressing problem behavior. Tailored to your dog’s pace, we customize each day to best fit their needs and learning style. Our trainer is able to dedicate several hours a day to your dogs learning and they learn directly from someone who has worked with numerous dogs, with the same challenges, allowing for fast results. We’re there every step of the way to help make this a smooth transition into a new lifestyle for your family. Dogs stay with us from Monday through Friday. You pick up on Friday evening with a quick go home lesson and keep them over the weekend to return to us Monday. This allows for you to practice with their new skills and give us feedback on where they still need a bit more polishing. We also have the option of keeping them over the weekend if you are traveling or have plans. Boot Camp is well suited for those looking for a happy companion eager to follow their lead. Pricing includes the 3 weeks of boarding, a strong foundational obedience, behavior problem solutions, remote training collar, go home sessions and follow up sessions to use at your discretion. This program has a lifetime of help from us. Your dog lives in our trainers home 24/7 (Not a loud stressful kennel) and goes home to you on the weekends. Real world training being treated as one of our trainer’s own pack and exposed to life’s regular distractions. Life time of help from us. If you need it, we’re here. No extra fees. Pricing includes all training collar costs. "Viktoria is amazing! Working with her is a different experience. She not only trains the dog but is careful to also train the owner." In puppy start right, your puppy and you will learn the foundations to having a healthy, happy, f un relationship with your dog. Good news is you don’t have to wait to train your puppy. You can begin day one! This program is for puppies between the ages of 8 weeks and 16 weeks old at the time of training. Starting early and right lets you avoid nearly all the complaints most owners have with their dogs! Stop jumping, mouthing, chewing and more while they are young and very receptive to training. You have the knowledge of a professional trainer at your fingertips to answer all your puppy rearing questions, as well as the added bonus of her pack of dogs to help socialize. We cannot stress how important proper socialization is for a young puppy. Spending the time on early learning will save you from stress and heartbreak later in life. We want you to have smooth sailing and fun with training when they reach that young adult stage. Get a step by step guide on how to raise the best dog you could ask for! Access to a professional dog trainer to answer questions during your puppy’s critical learning period. Ready To See a Real Change? Let’s get you a happy healthy relationship with your dog!